Anglican Church Grammar School (Churchie) is an independent school recognised as an international leader in the education of boys from Reception to Year 12. To complete an enrolment application online, click here. 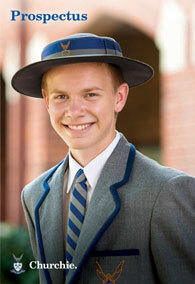 To make an application for your son to attend Churchie apply online. Explore Churchie's online tour, photo gallery and video galllery. Churchie’s Preparatory School (for students from Reception to Year 6) is built on a strong tradition and reputation of excellence, offering a high quality educational experience. Churchie’s Senior School is a vibrant learning community of Years 7 to 12 focused on the provision of a quality education designed to prepare young men for life and learning beyond school. Boarding at Churchie is for students from Years 7 to 12. Boarding students come from across Australia and overseas. Within Australia, students come from metropolitan and rural areas alike. Our seven-day-a-week boarding philosophy provides a place in which boarders can thrive academically, socially and personally.